The collection includes four maps on promotional materials issued by the firm of Jay Cooke & Co., sales literature for the bonds of the Northern Pacific Railroad. 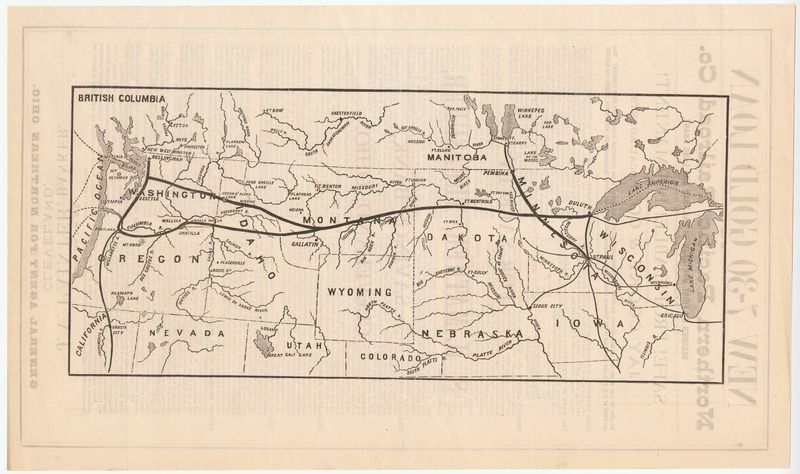 Each map features a thick black line tracing the course of the railroad from Minneapolis-St. Paul and Duluth in the east to Portland and Seattle in the West, suggesting its scope and permanence. Three of these were issued to sophisticated investors, ID #1075.01-.02, #2187.01-.02, and #2225.01-.03. These materials generally promoted the bonds as "Safe! Profitable! Permanent!” and providing “Perfect Safety" (#1075.02) because they were secured by “a first and only mortgage on all the property and rights” of the company. A careful reading of the text, however, revealed that no portion of the railroad had been completed. Indeed work had only recently begun, and only on "the eastern portion of the line," amounting to at most 10 percent of the project. Ibid. The fourth example, ID #2171, was a broadside aimed at a different audience: "Why Northern Pacific Railroad 7-30 Gold Bonds Are a Good Investment for the Farmer, Mechanic, Operative and Laborer?" In this case, the promoters emphasized that the “Workingman … cannot afford to risk his hard earned savings” and needs “to place their surplus where it will be perfectly safe.” It featured the same map in reduced size, with text added to show where the route of the railroad passed through “coal” and “wheat lands,” as well as “gold mines.” Again, the bonds were said to possess “entire safety, being secured by a first and only Mortgage on the entire Road and all its equipments” along with certain land. But this handbill made no mention whatsoever of the status of construction. The bonds were being sold by Jay Cooke, the “most powerful banker” of his era. Jenson 1975, 105. Cooke had achieved well-deserved renown for financing the Union during the Civil War by selling Treasury bonds that the government had been unable to sell. After the War, he turned to the expansion of the west, and he was optimistic about the Northern Pacific as much for its public good as for the financial opportunity. Oberholtzer 1907, 2:228. But despite Cooke's stellar reputation and an army of regional and local agents, the bonds proved very difficult to sell. Because of problems with climate and terrain, the railroad's projected cost per mile was much greater than its competitors.' (Ibid. 150). The bonds of other western railroads were selling at higher yields with less risk because they had been completed and were in operation. Ibid. 225-26, 234. The Northern Pacific was sarcastically dubbed "Jay Cooke's Banana Belt," referring to the shape of the route on Cooke's map, and to earlier misleading assertions that the climate along the line was temperate. Ibid. 295). With bond sales faltering, Cooke's firm itself repeatedly loaned money to the railroad to keep it afloat and maintain construction/ Ibid. 381-85, 436-37. Eventually, the burden became excessive; in September 1873, Jay Cooke & Co. failed and was put into bankruptcy, one of the major factors precipitating the Panic of 1873. The railroad survived the first years of the Panic, but declared bankruptcy in 1875, and construction was halted. After many struggles and several reorganizations, it was finally competed in 1883. Jenson 108-110.